The day I was leaving for China we got a call from USCIS with a major paperwork snag. A snag of such proportion that it would take at least a month to rectify. I prayed, I know many of you prayed. And our prayers were answered. My agency called today and our application has been approved! If you can’t tell by that exclamation point, we’re jumping for joy around here! Go God!! 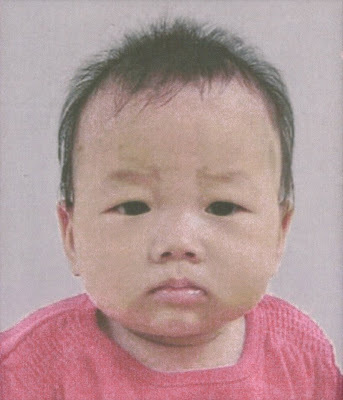 In honor of this fantastic news, I thought I’d share this adorable picture of our girl, one of her original referral pictures. How precious is she? That hair? Those pink lips? That knowing scowl? Congratulations Stefanie and familie. Hopefully the rest of the proces will follow quickly and you get a travel date. Have you decided with whom you are going to travel (alone, husband, daughter, sister?) Lots of luck with the rest of the preparations. Love Her cute little picture! Great news!! We were fingerprinted today. 🙂 Hope we dont have any “snags”. Love the photo! That is such GREAT NEWS! I’m so excited for you and know for certain it was the very hand of God, who loves the orphans more than we ever could, that intervened and cleared the way for you. That picture is priceless! What a dolly! That is so awesome, hopefully she will be in your arms soon!!! Can’t wait to share in another joyous journey with your family! The picture is so precious, thanks for sharing! That’s amazing news. So happy for you. She even looks a lot like my Empress. . . those lips get us every time she puckers them up!!!! So so happy for you! She is just precious! Oh, my word, she is ADORABLE!!! I am so happy for ya’ll!!! Yippee Jesus!! Congratulations!! She is adorable and yes she is thrilled about the good news, too! YAY YAY and double YAY!!! I LOVE this pic its so sweet! Wahoooo! Serious cute factor going on. Wow! Can’t wait to see her with the rest of the fam! Congratulations and YES GO GOD!!! He is awesome and I am so happy for you all! Blessings! What wonderful news! Your little one is too stinking adorable! She is so precious. I am also so glad to hear that everything was approved and you are still in the running. Congrats Stefanie and fam! Wow – she looks like she has got some ATTITUDE! You know I’m loving that… after all, I am a mom to a Tongginator. Heh. Oh and that FACE!!! LOVE HER!!! Congratulations!!!!! But then we all knew it would be fixed, now didn’t we?! Vivi is just precious…scowl or no scowl! I so wish you could bring her home with you on this trip…but I know all in good time. !!!! finally! She is breathtaking. YAY, GOD!!! So glad everything is on track again, Stefanie! Ya know, I think Vivi looks a bit like Sophie in this pic. Just adorable!! Horray for Vivi (& everyone)! Yahoo!! Can't wait to see that adorable little face in the arms of her Mommy & Daddy!!! How the hell is it, when people are waiting YEARS to bring home children from China, that you guys are popping over there yearly and getting a new child? Are you buying them or something? Something ain’t right or fair about that to those who wait and wait and wait (and yes, I am including those on the SN list), and yet like clockwork you get another.